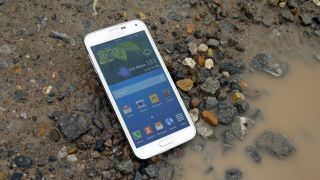 When Samsung launched the Galaxy S5 LTE-A in Korea we looked on enviously as those in the firm's home country enjoyed a handset with a newer, more powerful processor and superior screen. It was thought this supercharged Galaxy S5 wouldn't make it out of Korea but, according to SamMobile and a GFX Bench result for the SM-G901, Europe may well be in for a bit of a treat. Don't get too excited though, as the report states that Europe may miss out on the 2560 x 1440 QHD display, landing us instead with a bog standard 5.2-inch 1080p full HD affair. That's a shame, as we'd have loved to of seen Samsung tackle the QHD-toting LG G3 head-on in Europe, but it looks like we'll have to wait a little longer before that happens. According to the benchmark result, and backed up by a SamMobile source, the European variant will still apparently pack the newer Snapdragon 805 processor and Adreno 420 GPU, but it will have to make do with 2GB of RAM compared to 3GB in the Korean model. It appears that the cameras may stay the same, with a 16MP offering on the rear and a 2MP snapper up front. If the Samsung Galaxy S5 LTE-A is indeed destined for Europe, it's still unclear when it may arrive, but we'd expect it to see the light of day within the next two months if it is coming.